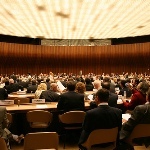 The Biological and Toxin Weapons Convention (BTWC) 2012 Meeting of Experts will be held in the Palais des Nations from 16 to 20 July 2012. The meeting will open at 10:00 on Monday 16 July in Room XVIII. The Seventh Review Conference decided the Meeting of Experts will also discuss how to enable fuller participation in the Confidence-building Measures (CBMs). For all documents related to the Meeting of Experts visit the UN Office at Geneva website HERE.